Non-enveloped, round, T=1 icosahedral symmetry, about 18-19 nm in diameter. Multipartite ssDNA genome (+) composed of 6 to 8 circular segments about 1kb in size. Each ssDNA segment have a common stem-loop region and are encapsidated in a separate particle. In addition to genomic DNA, up to 4 satellite-like DNAs are found in some isolates, usually encoding for accessory Rep proteins (para-Rep). These satellite-rep proteins are only able to initiate replication of their genomic DNA, unlike genomic encoded Master-Rep (M-Rep) which promotes replication of all 6 viral genomic ssDNAs (trans-replication). Each ssDNA genome segment is monocistronic, except for BBTV DNA-R which contains a second small ORF U5 internal to the Rep-encoding ORF. U3 and U5 are absent in ABTV. 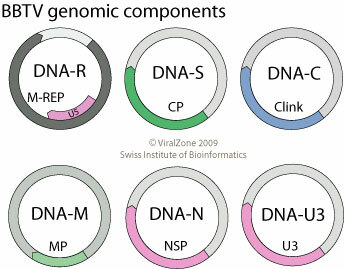 Uncoating, the viral ssDNA genome penetrates into the nucleus. The ssDNA is converted into dsDNA with the participation of cellular factors. Bidirectional dsDNA transcription from the IR promoter produces viral mRNAs and translation of viral proteins. Replication is initiated by cleavage of the (+)strand by REP, and occurs by rolling circle producing ssDNA genomes. b) be encapsidated by CP and form virions that will be released in the extracellular space. c) be transported outside the nucleus, to a neighboring cell through plasmodesmata (cell-cell movement) with the help of viral movement proteins. ETYMOLOGY Babu: From Banana bunchy top virus. GEOGRAPHY Asia, Pacific region and Africa. ASSOCIATED DISEASES Stunting, severe necrosis and early plant death. BBTV induces banana bunchy top disease (BBTD). TRANSMISSION Vector=Aphids (Pentalonia nigronervosa). The virus does not replicate in this vector. Protein Clink can bind retinoblastoma (pRB) and is possibly responsible for inducing transition from the G1 to S phase in preparation for virus replication since the virus targets differentiated non-dividing cells. .